The inspiration for tonight’s dinner came by way of the salad dressing in my fridge… really! I picked up a national brand Asian Sesame salad dressing recently and wondered how it would pair with chicken for dinner. 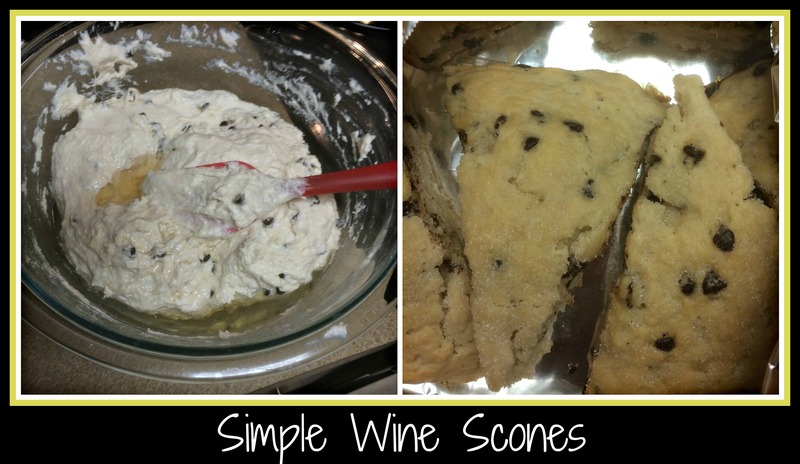 Thankfully, it paired beautifully and became the focus of this recipe. NOTE: You can substitute your own favorite dressing in this recipe… if you like it, feel free to use it for more than a salad. I started with two chicken breasts. I made a foil packet (using two pieces of foil) in my baking dish and placed the breasts together on the bottom of the dish. I then poured some Chardonnay white wine (I love using James River Chardonnay for this sort of recipe) and drizzled the dressing on the breasts before closing up the packet. I could have easily cooked the chicken for 30 minutes at 350 degrees, but I wanted to cook dinner much slower, so I let the breasts steam in the packet at 250 degrees for an hour. NOTE: Even at this much longer time frame, the breasts were tender and juicy… I love when an experiment goes well! 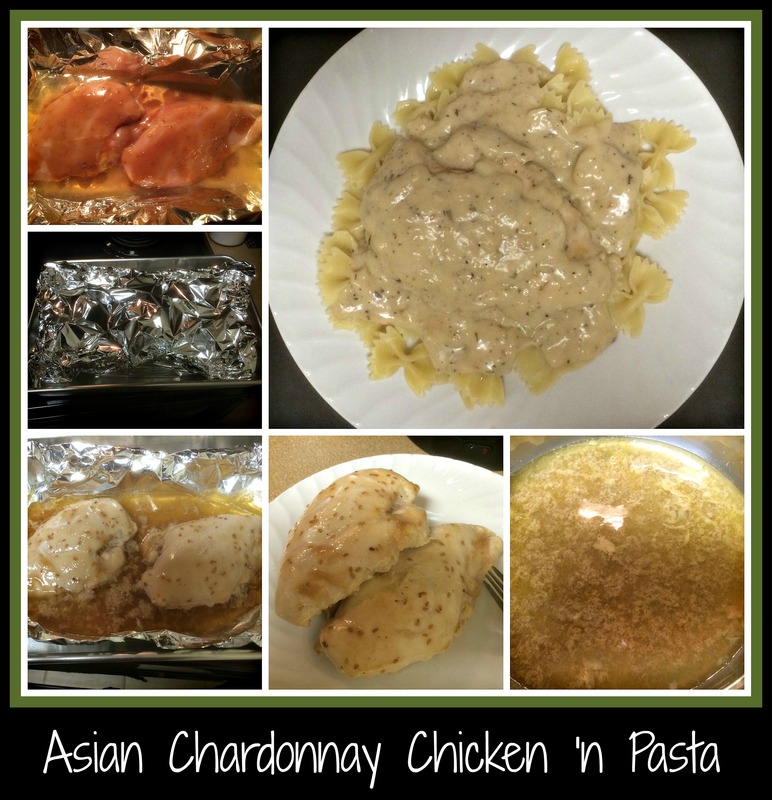 About 20 minutes before I wanted to serve dinner, I started making the bow tie pasta and added a touch of Chardonnay to the cooking liquid to flavor the pasta to mirror the chicken’s sauce. After taking the chicken out of the oven and opening the packet, I realized that the sauce was much too thin to be “good enough”, so I had some work to do. I removed the chicken to a plate and poured the cooking liquid into a saute pan. Using a bit of the cooking liquid, I made a slurry with some flour, whisked the slurry into the pan, and cooked the sauce until it thickened (which happened really quickly). For flavor, I added a few tablespoons of a garlic/herb light cheese, some salt and pepper, and a sprinkling of herbs de provence. Then, using a spoon and a fork, I turned the cooked chicken breasts over twice to pick up the sauce and warm the chicken a bit. Serving dinner was easy… I ladled pasta onto the plates, placed the chicken breast on top, then poured sauce over the entire meal. A side salad or a vegetable would have added a bit more color and a great boost of nutrition, but we opted to go with a very simple meal tonight. If my entire family was coming to dinner, I could have easily cooked more chicken/pasta and the additional vegetables/salad would have completed the meal. It’s the little things that can add to your meal each night. Adding your family’s favorite vegetable or some crusty bread to dinner can round things out quickly. Follow your instincts when it comes to cooking… and wait to hear the sounds of happy, satisfied family members singing your praises. Enjoy the food journey we all travel… it’s so much fun that way! I started planning dinner before I left for work this morning. I didn’t do anything as adventurous as get out the crock pot and start dinner… nope…. I just started thinking about what I wanted to make that evening. Such is my life when I get to talk about wine all day. Mind you, I’m definitely not complaining… just making an observation. When I lead guests through a wine tasting at James River Cellars Winery, I gloss over recipe ideas and offer up ways to use the various wines we have to offer. It’s the way I’ve always done wine tastings, but apparently it’s unique enough that people are stunned when I toss out recipe after recipe for our wines. Thankfully, the winery owners have allowed my blog to be linked to the winery’s website, Facebook page, and Twitter account – guess I’m doing something right, huh? I stopped off at the local grocery store to pick up a bag of shrimp on my way home and grabbed a tube of Pesto paste to use, along with some bow tie pasta. I thawed, peeled, and sliced the shrimp in half when I got home so that dinner prep would be as simple as possible. Then I got out the rest of my ingredients: a lemon, a pat of butter, olive oil, James River Cellars Winery Chardonnay, and a touch of half & half left over from another meal this week. Once my husband got home, I was ready to start cooking. I put some of the bow tie pasta into a pot with some salted water and got that started while I melted butter and olive oil in a large saute pan. As soon as the butter/oil mixture was hot, I added the shrimp and allowed it to cook thoroughly – I had sliced the shrimp length-wise so the thin shrimp pieces curled up into little corkscrews. Once the shrimp was cooked, it was time to start creating a sauce. I made the sauce with the shrimp in the pan. Sometimes I’ll remove the shrimp, but I was feeling a little lazy tonight and didn’t do this extra step. I added some wine to the shrimp and let it sizzle for a bit until the chardonnay had almost been absorbed by the shrimp. I then added the juice of the lemon, some pesto paste, a little more wine, a splash of half & half, and some of the pasta cooking liquid. I allowed this to simmer until the sauce looked thick enough before I tossed everything with the cooked pasta. It was quick and delicious! The entire meal, cooking from start to finish, really only took about 15 minutes. I even had enough time to defrost and toast a ciabatta roll so we could each have half to soak up the sauce. 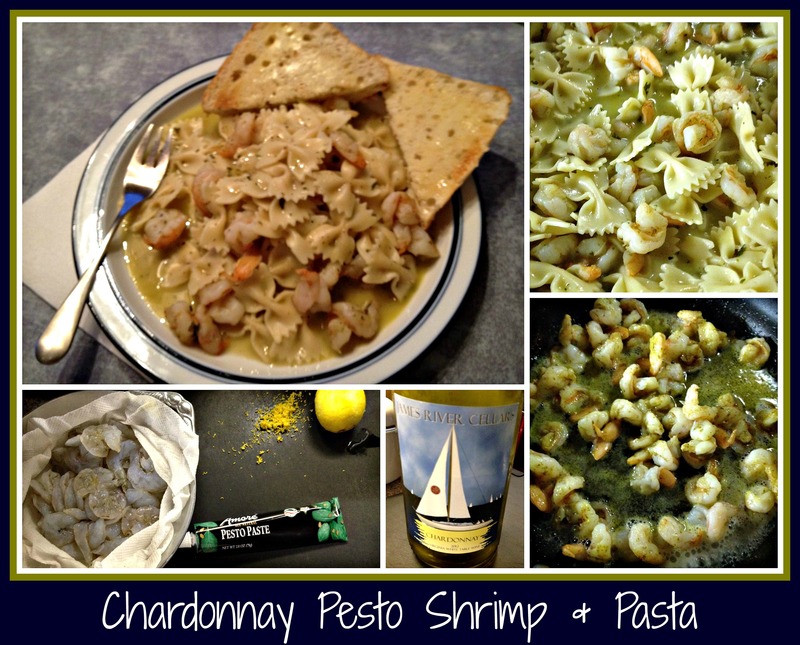 While there are tons of different things I could have added or changed about this recipe, the clean taste of the wine, lemon, and shrimp paired with the pasta was just what I was looking for tonight. I hope you’ll experiment with this recipe and come up with your own favorite version… it’s one of my favorite things to do. Enjoy! Just wanted to add a follow up recipe to the Kale Pesto recipe that I posted yesterday. I shared lots of ways to use kale pesto, but here’s a recipe that I used for breakfast this morning. 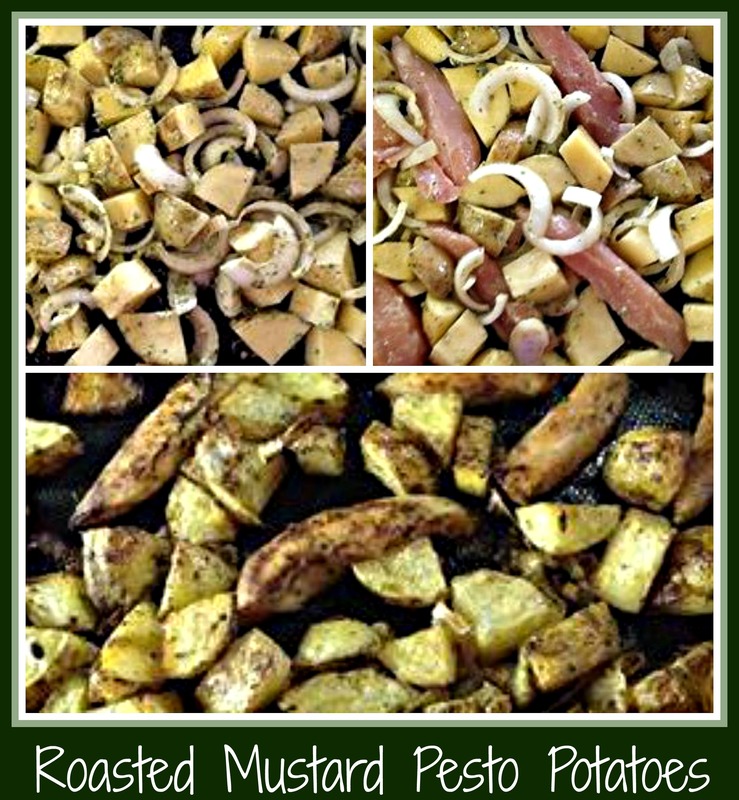 This recipe would make a great side dish and can certainly be altered as needed if you are following a diet plan that doesn’t allow for wine or other ingredients. I had already roasted and cooled some spaghetti squash, so I started with this ingredient as my focus. In a saute pan, I heated a small amount of olive oil, some crushed garlic, and a large spoonful of Kale Pesto. 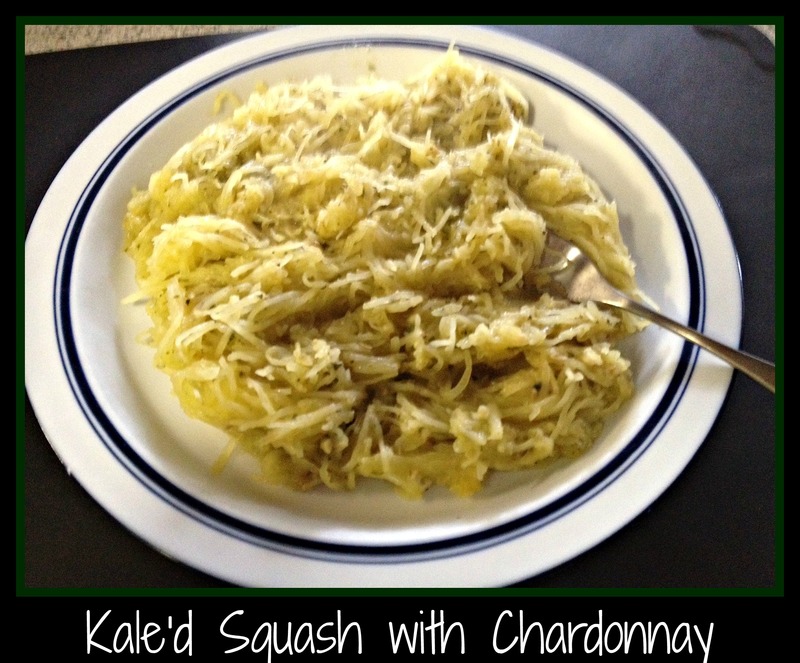 Once this was sizzling, I added 2 cups of spaghetti squash, along with a nice amount of James River Cellars Chardonnay, and tossed all the ingredients together, cooking them until everything was toasty and fragrant. As I completed this recipe, I added some salt and pepper to taste and topped with a small amount of grated asiago cheese. Since the alcohol in the wine had cooked out and I still had the back-taste of chardonnay in my food, this was a really tasty breakfast, but would have made an equally yummy lunch or even a full meal (if I added some protein). Isn’t that a great way to kick off a new day? Enjoy!